We're Oregon fishing guides specializing in fishing NW Oregon rivers, bays and the Pacific Ocean for salmon, sturgeon, steelhead, bottom fish and Dungeness Crab! Kevin and Lacey pride themselves on fishing in Oregon's best locations at the best times! 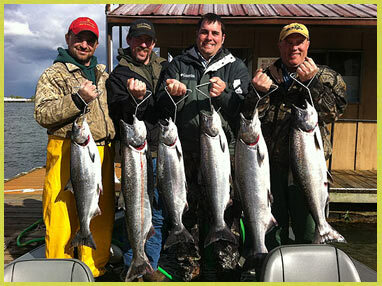 We offer guided fishing trips in both the Portland Oregon and Astoria Oregon areas of the Columbia River as well as Tillamook Bay and the Willamette River. We use world class equipment to catch world class fish! Providing a productive, fun, and safe fishing trip is our #1 goal! Guides Kevin Newell and Lacey DeWeert own and run Total Fisherman Guide Service. We are customer focused and understand that catching fish is a high priority but it isn't the only priority. Having fun, using high quality well maintained equipment and boats, treating you with respect, and being available as a fishing resource even after your trip are also extremely important. We understand that having a successful fishing trip is about you and what you want, and we aim to provide that on every single trip! Our Columbia River Spring Chinook Salmon season starts in March beginning an almost nine month season of salmon fishing! Coho Salmon become available in mid summer and these silver acrobats combined with prolific runs of Chinook salmon make our Oregon salmon fishing some of the best in the world. Great light tackle sturgeon fishing can be found on the lower Columbia and Willamette Rivers all year long! 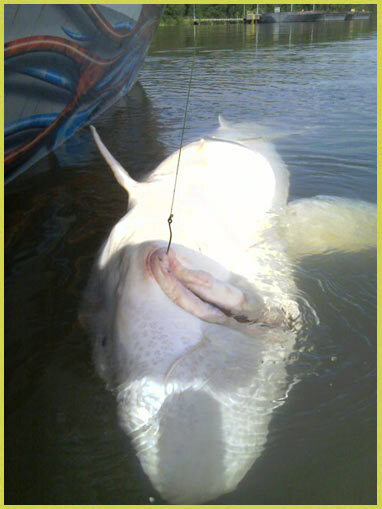 Keeper sturgeon, oversize "Trophy" sturgeon, and catch and release opportunity abounds throughout the year! © Copyright Total Fisherman 2011. All Rights Reserved.